Our most recent litter was our 2013 litter out of Blur by Zeke. We are not planning a 2014 litter. Please contact for more info, or to discuss future litters. 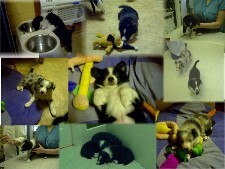 Our Border Collie puppies are seen by a vet for a health check and shots. Other breeders may choose to inoculate their pups themselves and/or choose a vaccination protocol that delays shots or is non-existent. I have had experience with various animals since I was a child, my profession is in clinical science, and have even had coursework and performed micro-surgery. I am very capable of determining if an animal is healthy, however I still feel a buyer has the right to have a professional give them their opinion via a health check, there are still some things that animal savvy people overlook and you deserve formal paperwork regarding the health of your puppy. I can respect the ongoing research on vaccinations and feeding, so prefer to work one on one with puppy owners for them to make educated decisions vs laying down the law on health and nutrition. On the topic of surrendering a puppy. Yes we are here for questions for the life of the dog, even if it is assistance with rehoming, although I don't find the later to be a boasting point on the part of any breeder. I tend to be finicky in placement of the pups, and stand behind my statement they are "to approved homes" but to boast "we offer returns" is like planning the divorce before the wedding. You may also notice we don't offer "parents on premises". In the future KEG may offer stud service, but I strongly feel that owning both parents isn't necessarily impressive, yet is limiting. To me that says "everything I look for in a perfect match for my female is in the OTHER dog I own". Selection of an outside mate offers much more compatibility and opportunity for that in each particular breeding. To slightly broaden that, we would have to have many, many dogs. Which leads to my next point. Our dogs are first and foremost, our companions. Although younger dogs may be crated in the house for safety and the socialization aspect for such a necessity on competition days, I will NOT kennel them. They are part of the family, and in the house. A new addition would have to be on the basis we can provide attention to them as an individual, not locked up in a barn, basement or kennel run. To further elaborate on this concept, we strive for QUALITY not quantity. 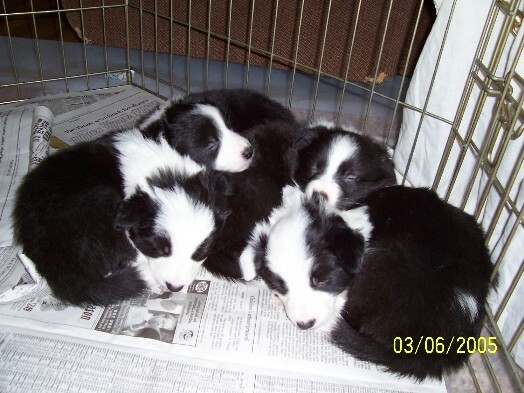 We don't have many litters a year or necessarily even one per year. We don't keep intact puppies from every litter, we don't raise and then rehome, or co-own and farm them out to live elsewhere. If they are carrying out our farm name bred by us, than they were raised, handled and cared for HERE under KEG's roof. As an important part of our family, our border collies primarily practice disc and flyball(we have dabbled in other venues this is just OUR home focus), and sometimes travel the North East and Canada for competitions. For playtime in the yard they are protected by Pet Stop underground fence, are also microchipped, up to date on shots but not over inoculated, and fed a premium dog food, some raw, and supplements for enhancement. Our pups are raised as part of our family. They are socialized to noises, livestock, and other pets as well as children. 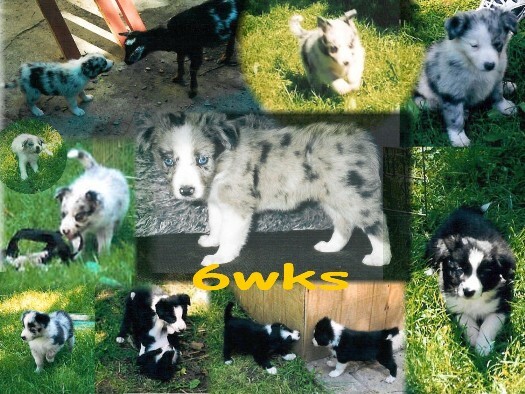 They begin crate training, are weaned on premium food, go home on spay/neuter contract, with lots of baby pictures and are registered with the working registry for border collies... ABCA. It is important our litters get plenty of attention, and go to loving homes so we plan accordingly and may not schedule a litter until we have some prospective new owners AND our schedule can accomodate the puppy rearing phase. We work with our puppies. It isn't uncommon for 8wk old puppies to leave here knowing how to fetch, sit, play tug, and have a good foundation of outdoor pottytraining. Border Collies are recognized for their intelligence. They are little sponges and it is amazing what they can learn to do at such a young age. It is never too early to start.